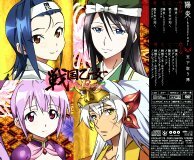 This CD+DVD package contains the opening song to the TV anime Sengoku Otome (戦国乙女). Songs by the seiyuu group Tenka Toritai (天下取り隊), made up of Akesaka Satomi (明坂聡美), Ise Mariya (伊瀬茉莉也), Kokuryuu Sachi, Mochizuki Rei. This is the debut song for Tenka Toritai. The DVD contains a promo video of Kagerou featuring the four seiyuu. There is also a "making of" video, and the non-credit version of the opening and ending animation of Sengoku Otome. The DVD contains around 12 minutes of video.